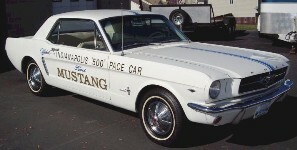 A quantity of 185 Mustang Indianapolis Pace Car hardtop replicas were sold in 1964 to the public. Not just any dealer could sell them though. They had to compete for them! The competition, called "Checkered Flag" and "Green Flag" contests, were based on the dealer's sales performance prior to the introduction of the Mustang in April of 1964. The top five dealerships in each district received a Pace Car replica. This car was won by Bennett Ford in Salt Lake City, Utah. The pace cars are all sequentially numbered (VIN) between 111500-126000. They have the same dataplate codes; 65A=hardtop, C=Pace Car White paint, 42=white & blue interior. Many were sold to customers with the stripes and lettering removed. Another thirty-seven Wimbledon White 1964 Mustang Pace Car convertibles were created for the actual Indianapolis 500 race. Three of them were modified to be actual pace cars (4-speed transmission, tuned 289ci engines, lowered suspension, and speed rated tires). Another thirty-five convertibles with red, white, or blue interiors were used as Dignitary Cars. They were auctioned to dealerships and sold to the public after the race event. This is a 1964 Mustang Indianapolis Pace Car. It's one of about 190 hardtop replicas built for sale to the public. They were all built the same: special Pace Car White paint, blue stripes, and white/blue interiors. All of the Pace Cars are sequentially numbered (VIN) between 111500-126000.